With summer coming to a close, many feel the time for swimming lessons is ending as well; however, this couldn’t be further from the truth. At B&C Aquatics, we want our swimmers and families all across the GTA to understand swimming lessons carry significant importance all year-round and shouldn’t be limited to just the warm months–find out why below! For some swimmers, overcoming the fear and insecurities associated with learning to swim may have made the summer swim season rather stressful. Coming into fall, your swimmer may just be truly getting comfortable with entrusting their safety to their swim teacher and learning to approach their lessons with confidence. 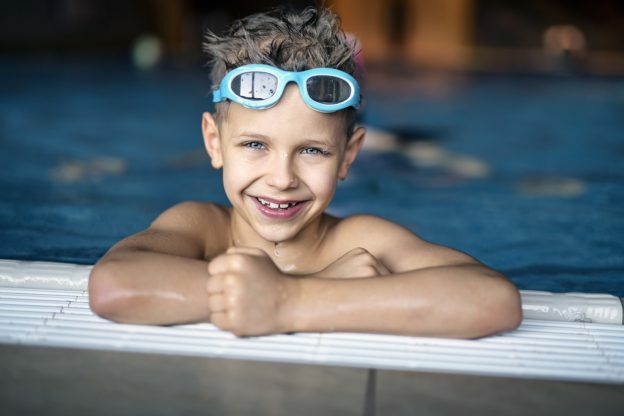 In this scenario, stopping swimming lessons after the summer prevents the swimmer from really experiencing the joy swimming offers and recognizing the success they can have in the pool. Another important reason to keep swimming, after the summer, is the continuous improvement! Only swimming for one season a year, leaves a lot of time for a swimmer to lose the skills they developed before next summer comes around and they’re back at square one. Continuing swimming lessons in the colder months enable swimmers to continue to improve their skills and get better. At the core of swimming lessons is water safety. Water hazards are very real and aren’t limited to just one season–whether it’s family trip to the beach in the summer or a friend’s birthday party at a local indoor pool in winter, having swim skills helps keep your child safe in a plethora of scenarios. Owners Bonnie and Christopher Buckler of B & C Aquatics Limited bring more than 50 years of family aquatic knowledge to the company, which was incorporated in 1991. With locations in Toronto and Pickering, we proudly instruct more than 3,000 individuals a week, with a staff of 70 instructors who work alongside Bonnie and Christopher personally.